Secluded from other vacationers the cottage is located on a 1/3 acre peninsula immediately off Route 15. Conveniently eight miles south of Smiths Falls and 45 minutes from 1000 island bridge. The cottage has a private dock and a gated lockable entry. There is a second dock and parking space used by patrons of the island cottage. Currently priced in American Currency. Please add 20% to listed price to estimate actual cost in Canadian currency. Sorry for the inconvenience. Gorgeous Canadian sunsets, and lots of room for the kids to play! This cottage is a very good value. Its a nice property and quaint cottage located on the west side of highway 15 there is a nature trail on the opposite side of the highway. You can kayak under the highway on Otter Creek to take an adventure into an everglade like winding waterway that goes on for about 1 kilometer with birds, beavers, turtles, large frogs, and many other creatures to observe. Being next to highway 15 can cause road noise which many people get used to but some may find it undesirable. Since there is not a beach and the water depth does not get past 3 meters deep for about 100 meters from shore better swimming locations may be found using the kayaks or by renting a boat at lens cove in Portland. This is primarily a fishing cottage with no neighbors where you can be as loud as you wish. My name is Bret Hartman and I'm the trustee for the property. This cottage is a fantastic place to have a great time with friends and family. There are no neighbors to disrupt your privacy or good times. There are many places to visit for example historical Perth is a 15 minute drive. Portland and the Big Rideau is a 5 minute drive. Ottawa is about a 45 minute drive north. Driving to Ottawa is a great day trip where you can find anything your heart desires. This Bay is a wildlife mecca. It's the best fishing on the lake hands down. The most experienced fisherman on the lake travel to this bay to do their fishing and you can cast a line right off the dock and kick back. The cottage is situated right off of highway 15 making traveling easy. Across the street is a hiking trail where you can observe the everglade-like nature preserve that is visible from our google map of the cottage. 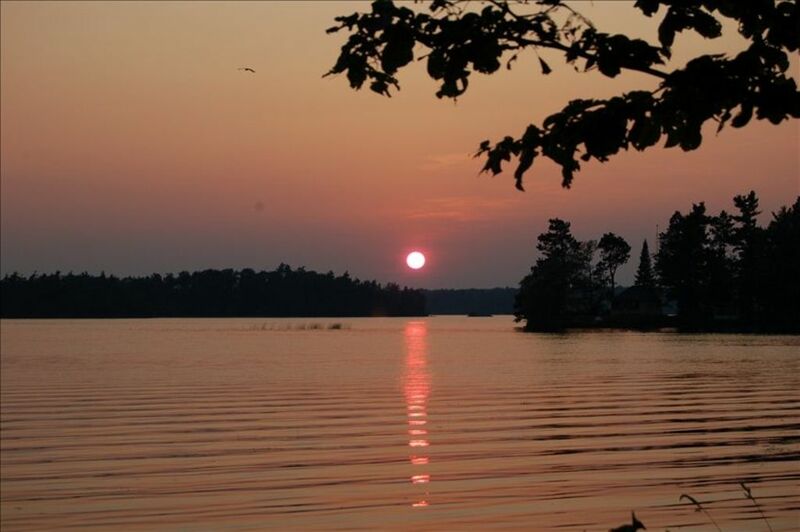 The Sun sets on the opposite side of the lake making evenings warm and beautiful. With no neighbors to ruin those quiet evenings. The Cottage is surrounded by water on three sides. Otter Creek runs along the left side of the property bringing additional wildlife and serenity to the property. This Cottage is an optimal fishing and wildlife location. With a nature walk across the street. The bay has an abundance of fish, birds, turtles, frogs, beavers, otters etc.. The waterfront is 4-10 feet deep for 100-200 meters from shores edge. Deep enough for most boats. The bottom is a mixture of rocks, silt, and seaweed. Scotia Bank is in Smith Falls, Super WalMart, Canadian Tire and Independent Grocery are great places for food or any other items you might need. The Hospital is in Smith Falls which is 8 miles North of Cottage on Route 15. The cottage is right off of highway 15 therefore some road noise should be expected. There are trees and bushes which provided about 80% visual privacy. The swimming may not be considered ideal by some due to weedy bottom I recommend taking the kayaks around to find your ideal swimming spot. Finding a cottage without neighbors is hard to find therefore I believe this out weighs the roads close proximity and less them optimal swimming.